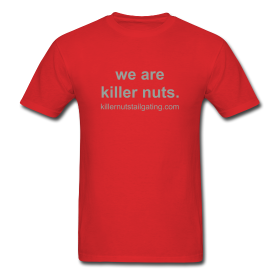 As an added feature this year on Killer Nuts Tailgating, we will be providing a few recipes from each weekend’s get together. 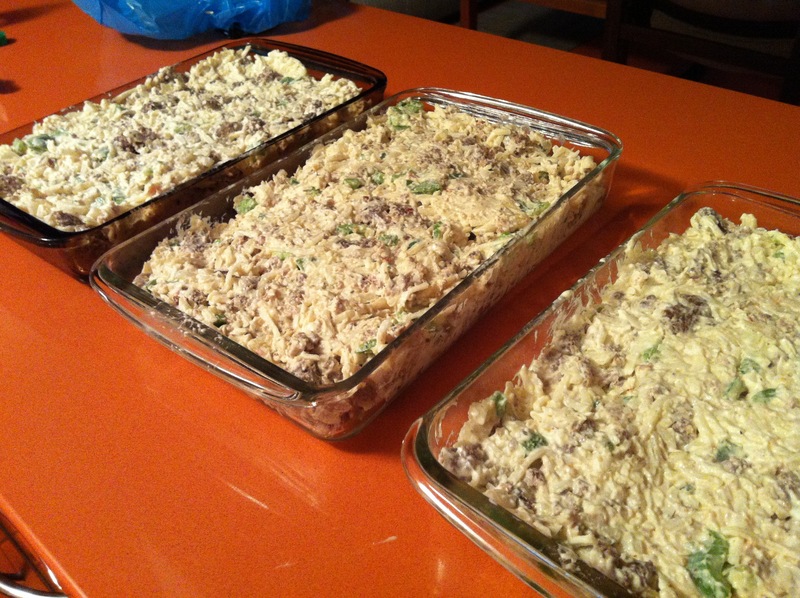 This past week for the Buckeyes home opener, we chose a traditional eye opener, an eggless breakfast casserole. As some in our crowd H-A-T-E eggs in any form, we found this casserole a few years back, that makes everyone happy — unless you look at the calorie content, which we don’t. Quick, easy, very tasty, filling, and if you remember to put the leftovers in a cooler with ice, it reheats well the next day too! • 1 pound ground sausage. (I always double this recipe; for the version with more heat, use a mix of regular and hot sausage.). In a skillet, cook the sausage until browned. Drain well. In a large mixing bowl, combine the sausage (or cooked bacon or ham or veggies), cheese, chicken soup, sour cream, French onion dip, chopped onion, bell peppers, salt and pepper. Mix in thawed hash brown potatoes. We have found the best method for really getting this mixed well is to just use a LARGE bowl and your hands. Spread in a 9 X 13-inch greased baking dish. Bake at 350°F for about one hour or until casserole is golden brown. I usually bake for about 45 minutes with casseroles covered with foil and then uncover and continue to bake until I think they are done. This tends to keep them moister than if baked completely uncovered. 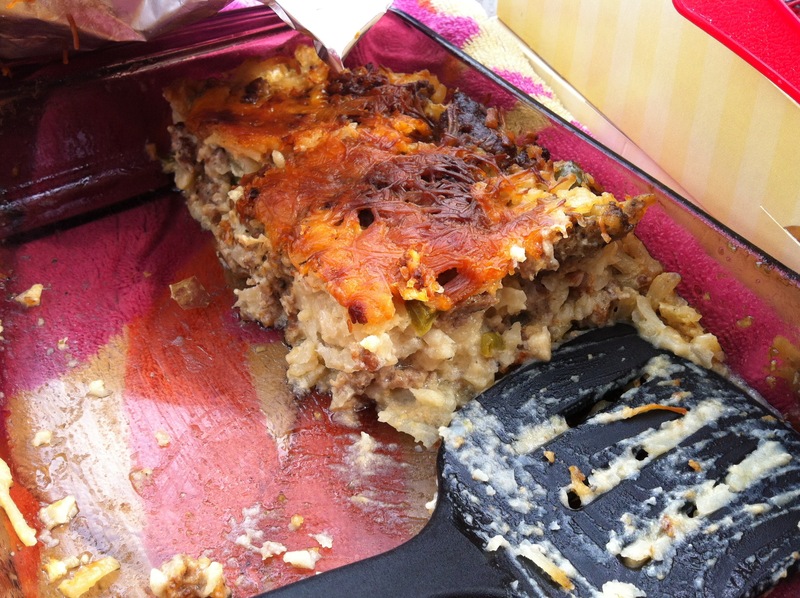 As for keeping casseroles warm, you can either bake before going to tailgate, or, as we did, bake them the night before and then reheat thoroughly in the morning. Cover with foil. Then we take a sturdy box about a foot deep and line the bottom with beach towels, wrapping each casserole in a towel, stacking them in the box and then covering with another towel. I know some people have those nifty hot food carrying cases, which are awesome, but we have found the towel method is pretty easy to deal with when it comes to spills, as spilled chili in a carrying case can result in a long scrub to get it out of all the nooks and crannies and stitching. With the towels, you just throw in the washer, and if the box get bad, throw it out and find a new one. When it comes to seriously cold weather games, we have several old pizza delivery carriers that help insulate the food even more, and we leave the box in the car until its time to eat. The rest of Saturday’s menu, provided by the rest of the crew included fresh Caprese salad (tomato slices, slices of fresh mozzarella, roughly fresh basil chopped, olive oil), fresh fruit salad, cheese and crackers, cookies and pound cake, as well as Buckeye donuts from Tim Hortons — chocolate glazed donuts with a dollop of peanut butter in the hole! Check back next week for this coming Saturday’s menu for the OSU v. University of Central Florida. I love this recipe. My husband does not eat eggs and this is our go to Christmas breakfast casserole. I actually like mine a little crispy so I cook for about 1 1/2 hours. Yum! Thanks for sharing!